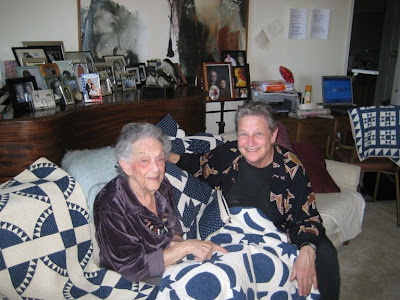 Julie Silber's Blog: World's Oldest (?) 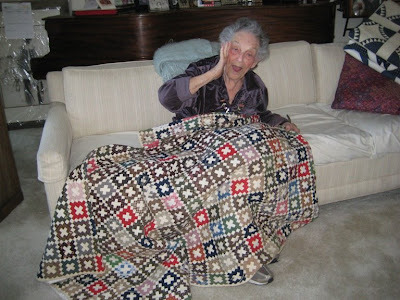 ...and Definitely CUTEST ... Quilt Collectors! World's Oldest (?) ...and Definitely CUTEST ... Quilt Collectors! Early May, 2009 . . . I visit my parents, now 97 and nearly-95, every month ... each time for about a week. My parents have been collecting antique quilts for about 40 years. 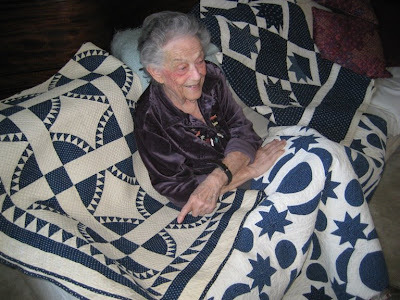 They may be the oldest living collectors of antique quilts ~ they are, FOR SURE, the Cutest! 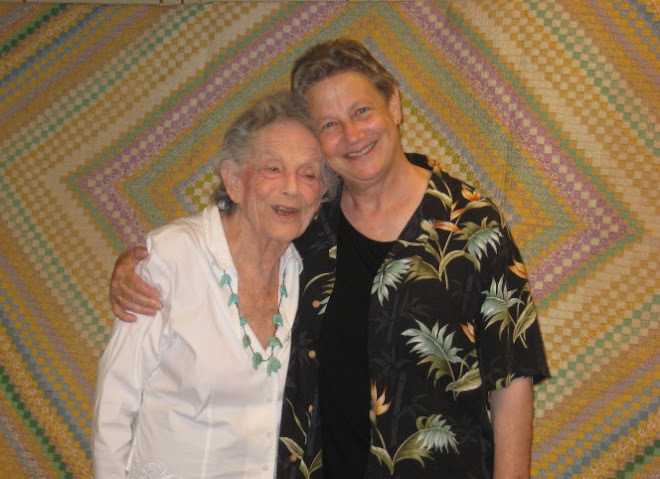 Earlier this month, I pulled out some of their quilts, and asked them to let me take some photos. 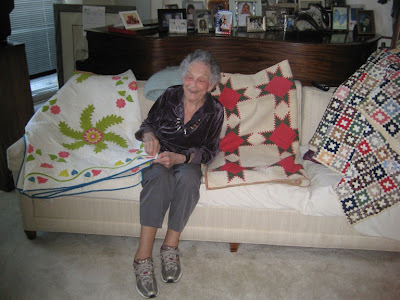 With a very full heart, I share with you my folks, and some of their antique quilt treasures. to Mom for her birthday a couple of years ago. 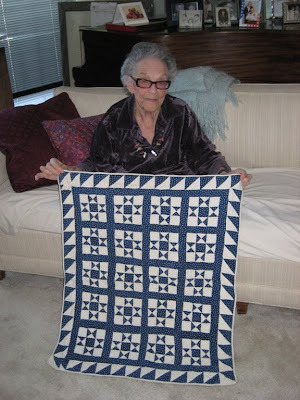 Below: Mom, with that quilt... and her glasses! 19th century indigo and white quilts. She said she had forgotten just how TINY they were! I'm going again for Mom's 95th Birthday in early July. I'll take more photos of them and their quilts then. Stay tuned if you like this thread! Oh Julie, This brought tears to my eyes! How great. Please keep adding more pictures. I never got to meet your Mom - or Dad, of course.. How lucky that you still have both and that you see them so often! Oh my gosh Julie - you are so blessed, doubly blessed to have both parents still with you and the chance to visit often. Even better is the heritage you share in the love of antique quilts. What a treasure. Enjoying this thread? Absolutely. What wonderful photos, as discussed it so precious to have both your parents still with you, as I do here in England, I treasure every moment I can spend with them, as you do. Keep the photos coming, they help tell a wonderful story. how special these pictures are. How lucky you are to still have your parents and your able to visit with them this much. beautiful quilts too , oh thank you and your parents for sharing them with us. Dearest Julie, I just wanted to see some pictures of Al and Merry today - and here they are. All our family is thinking about you and yours today - re-living the 'crazy-quilt' of memories of shared families and childhoods in Detroit. We send you love and sympathy in these days of sorrow over the loss of your father and joy in the great celebration of his life. 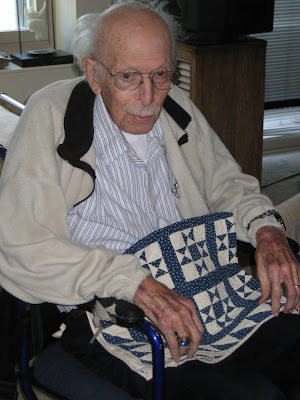 Thank you for sharing your parents wonderful quilts and their wonderful story.